As a writing mom on the run, I'm starting a new project called A Runner's Guide to Parenting. How do you know when you’re a runner? I wish I could remember when I became one. I remember the first pair of shoes I got in high school, the same as all the other girls on the track team. I didn’t intend to become a runner. Some friends suggested I give it a try and then gradually, without anyone telling me, I became a runner. And my life changed forever. I can’t pinpoint the exact moment I thought of myself as a runner, but I know by the time I showed up at college a week early for running camp, I thought of myself as a runner. It was a part of who I was. Sure, there were times in my life when I wasn’t running very much, if at all. Mostly due to parenting. Was I allowed to call myself a runner if I was only running once a week? What about once a month? I don't think I ever said "I was a runner." But I often said, "I want to start running again." The moment I thought of myself as a parent is equally unclear. Was it when I found out I was pregnant? Was it the first time I changed a diaper? Yes, the first diaper I ever changed belonged to my newborn son. A bunch of my friends were having babies, too. And getting all that baby gear was almost as exciting as getting my first pair of running shoes. Honestly, I don’t even think I really grasped the fact that I was a parent when they handed me my new baby boy. Because just like when I got my first running shoes, there was still a lot of breaking in to be done, a lot of miles to cover. But gradually, without anyone telling me, I became a parent. And my life changed forever. Being a parent means worrying about something you love very, very much (I'm talking about your children) but we can't alway control, like when your child pats a relative on the tummy and asks, "Why are you so fat?" Running is like that, too. You can work really hard to prepare but sometimes the race throws things at you that you can't control, like the time my training partner had to race her first Olympic triathlon in the pouring rain with wind gusts up to 23 mph. So when do you know you've earned the title? I think the easiest answer is: you’re a runner or a parent when you do it. There’s a saying, “Castles were built a stone at a time.” It’s the same with running and parenting. Bit by bit, you build your identity as one and the other. And then one day, you realize you are both a runner and a parent. 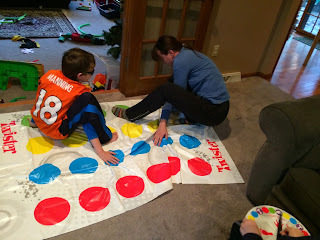 And maybe like me, you really know you’re a running parent when your post-run stretching routine is actually a game of Twister. But the moment when you know you’re good at either one of these activities is even more elusive. ‘Good’ is such a subjective measure. So personal. I might finish first in my age group in a small neighborhood race but have a terrible overall time. I might run the race of my life and finish in the bottom half, maybe even bottom third of my age group and not a single person even notices or cares about my moment of glory. Parenting is the same way. So many times our best moments go unnoticed by anyone. I might help my oldest tackle a tough writing assignment, or coax my middle son out of the grumps by cracking a joke, or remain patient as a saint as my youngest 'helps' with cooking dinner. These are private moments of parenting glory that no one cares about but me and my kids. That’s life as a running parent. There are no medals for our best moments.And that's ok, because we aren't doing either one of these for outside approval, are we? We're doing it out of love. How does running influence your parenting and vice versa?